I was so inspired by a recent craft book purchase that I had to dive into one of the projects. 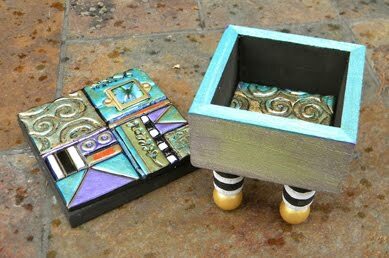 A small wooden box elevated on painted legs. 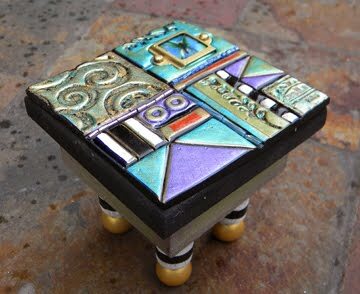 The lid and inside panel are painted polymer clay. The brass frame is real and holds a tiny picture of a butterfly from one of my cards. The textures were created with rubber stamps and I used small seed beads to make some of the thinner stripes. The swirl part is covered with gold leaf. Lots of steps to this fun project!